Time for another visit to my collections and this time a look at Belleek porcelain. In 1858 Belleek was a small village owned by the Bloomfield family of Castle Caldwell in County Fermanagh, Ireland. John Caldwell Bloomfield had recently inherited the estate from his father and he was anxious about providing work for his tennants to protect them against disasters such as the Great Potato Famine that had devastated Ireland a few years previously; causing a million people to starve to death and forcing another million to flee the country seeking work in America, Canada and Australia. Bloomfield noticed the unusual lustre of the limestone finish that his tennants applied to the walls of their cottages and, having an interest in ceramics and minerology, he decided to try to establish a pottery industry utilising the local clay and mineral feldspar which were present on his property. The two key things he was lacking were capital and know-how. So he pitched his idea to Dublin businessman David McBirney and London architect Robert Williams Armstrong. McBirney financed the project and Armstrong used his interest in ceramics and his architectural skills to design and build the pottery, also becoming the pottery’s first manager. So Belleek Pottery was born; providing security for local tennants who no longer had to rely soley on agriculture to sustain their community. The original output was earthenware, utilitarian pieces. But McBirney and Armstrong were keen to get into porcelain and began experimenting in this field, finally achieving some success in 1863. They brought skilled artisans such as Willam Bromley and William Gallimore over from Stoke-on-Trent to head up the Parian and modelling departments and to teach the local people the skills needed to make finer products. Belleek’s original porcelain manufacture was fine Parian baskets with delicate woven bases and flowing floral decorations, and by the beginning of the 20th century this side of the pottery had pretty much taken over from the original utilitarian works. This Parian ware is a fine white porcelain having the appearance of marble. It is delicate and translucent with the light readily shining through the sides of the pieces. 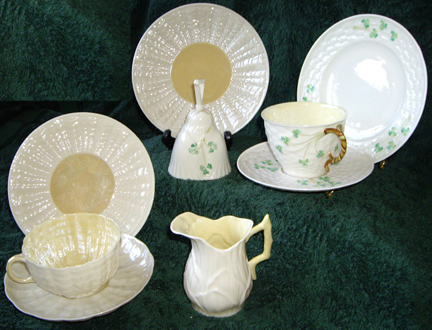 The glaze used by Belleek is one of the most beautiful you will ever come across. In 1857 Belleek secured the patent for a nacreous glaze that is extremely smooth surfaced, is unaffected by hairline cracking and is dust resistant (and yes, it really is). It is a beautiful creamy glaze and older Belleek pieces are typicaly a buttery yellow colour inside. Belleek have made it easy to date their porcelain by changing the backstamp with which they mark their wares about 9 times since 1863. Each change has been documented so it’s easy to tell which period a piece comes from by the differences in the back stamp. The cup, saucer and plate trio on the left are my favourite and oldest pieces. They carry the second black mark which dates them between 1891 and 1926. I just love the beautiful lustre of these pieces and their translucent quality. The green shamrock trio bears the fourth mark (1st green mark) and is from 1946-1955. and the little jug in the front carries the sixth mark and is from 1965-1980. Although the later pieces are beautiful delicate items by most other pottery’s standards, you can tell the difference in the fineness and translucency of the porcelain in the older pieces compared to the later ones. It’s gorgeous! So beautiful. Do you use any of it? I’d be too scared I think! I must confess that this one’s just for looks. It is so delicate that I don’t actually use it. Although on rare and special occassions I have been known to drink tea from that old creamy cup and saucer. wow what beautiful pieces Karen. They are BEAUTIFUL! I love the history of the porcelain too. hmmm, my comment didn’t go through, so if I post twice, I apologize. here we go again: coming from a past of irish potato growers, i was very intrigued by your post. Thanks for sharing – the trio on the bottom looks exquisite! Beautiful pieces Karen. That’s an interesting handle on the green shamrock cup. The older pieces seem to have the luster of pearls. Another lovely collection of yours! When I lived in Canada I had a small antiques shop and was lucky enough to have a few pieces of Belleek pass through my hands, but I never started a personal collection. I remember going into a shop in a large city in Canada that sold NEW porcelain and they had pieces of NEW Belleek. It is not nearly as carefully, delicately or intricately designed and decorated as the vintage pieces were. I am a firm believer in buying VINTAGE over NEW, if at all possible, mainly for the fact that even everyday items were produced with quality that we never see today, except for very high priced items. Thanks for all your great “SCRAPS OF MIND”! You have some fascinating collections. Love the porcelain.